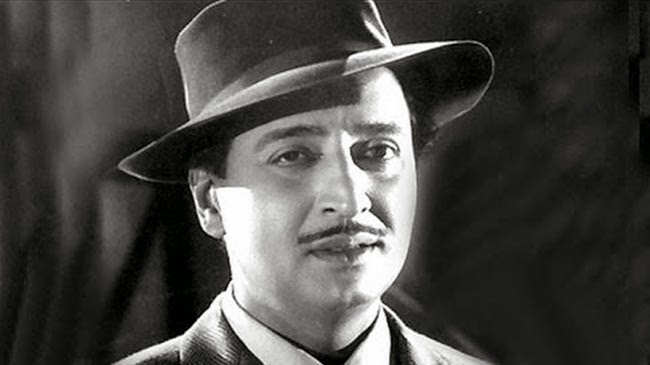 Pran, an icon of Hindi cinema, passed away in 2013. It’s that time of year again when film canonisation rears its ugly head, pontificating at the greatest hits. The sheer deluge of best of lists makes it an almost impossible art to try and make sense of it all. I prefer the individual lists by critics, reviewers and bloggers as they pin down more esoteric tastes procured over the year. Sight and Sound is always first out of the end of year sprint to name and shame, and The Act of Killing seems to be popping up as number one with annoying regularity on many a lists. I initially had the film on my top ten but realised Upstream Colour seemed like a favourable substitution. The Act of Killing appearing as perhaps the best film of the year, as determined by critics and reviewers alike, is more indicative of the way documentary is still enjoying its moment, a moment which can be traced back to Bowling for Columbine and the Michael Moore effect. I’m not entirely convinced by Oppenheimer’s ideological approach to the material since the absence of context(s) not only unveils a pre-determined construction but also brings into doubt the politics of a very political documentary. For a more lengthy and sustained take down of the documentary, I would recommend Tony Rayn’s piece for Sight and Sound eponymously titled ‘Build my Gallows High’. But what about Indian Cinema I hear you say? How was it for the biggest film industry in the world in 2013? (a question that I can never hope to answer since I’ve not seen as much as I would have liked to this year) That seems like a pretty good place to start when it comes to looking back at the year but unfortunately, like so many years in the past, Indian films rarely ever make it to end of year lists. I have discussed the reasons for Indian cinema’s exclusion from canonisation and cinephile discourse particularly in mainstream western film journalism in a previous post so I am simply going to point in that direction rather than reiterate a similarly impassioned defence. Yes, I understand, Indian film distributors are not involved in the gambit of press screenings whereby they exclude themselves from end of year lists, and yes, many of the best Indian films (especially Indie and regional ones) never make it to UK film screens, but there are a number of films which could have easily made it on to end of year lists. Before I offer yet another list, I am going to underline a few observations about Indian Cinema in 2013, points not specifically related to the films I have chosen to include in my end of year list on Indian cinema. 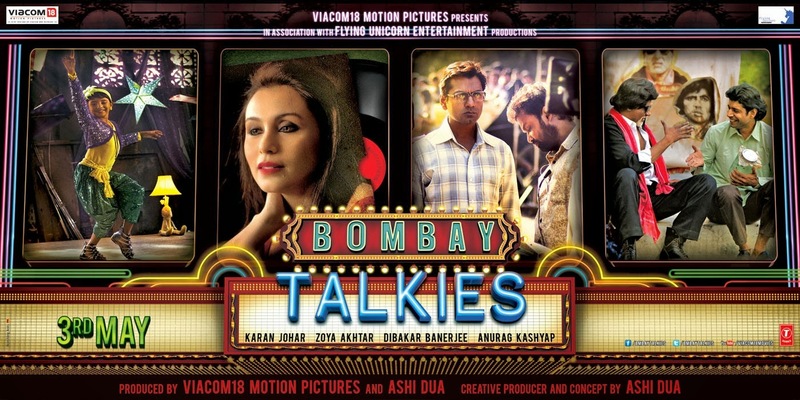 Bombay Talkies, a portmanteau, was produced and released to coincide with 100 years of Indian Cinema. 2013 may not have been significant in terms of the filmmaking landscape and output, but this has been a year of celebration for Indian Cinema. Such a historic landmark has been commemorated in India in different ways including films, events and exhibitions. The Bradford Film Festival offered one of the most engaged celebrations with a strand dedicated to the screening of classic and contemporary Indian films such as the newly restored Kalpana. Films including Bombay Talkies, Celluloid and Shabdo were financed with the specific aim of celebrating the achievements of the film industry. I was somewhat perturbed by the unenthusiastic response from some sections of mainstream film journalism who seemed to be dismissive and ignorant of the role India has played in the history of film. Satyajit Ray also reappeared on the radar of cinephile discourse with a major retrospective of his work at the BFI Southbank coinciding with the timely Blu-ray release of key films like Charulata in restored new prints. Indie cinema vs. mainstream Hindi cinema; this is an on going pattern in terms of distribution and more edgy, indie films really felt the squeeze of the tent pole Hindi films in 2013. The London Indian Film Festival has become a key date in the Indian indie film calendar in terms of getting exposure for new emerging filmmakers. While this is undeniably true, many indie films simply bypassed cinema exhibition including B.A. Pass (Ajay Bahl), Bombay Talkies and David (Bejoy Nambiar). SRK seemed to have the top spot at the Indian box office (both domestic and international) pretty much sewn up with the spectacular success of Chennai Express. I enjoyed Chennai Express, although some critics savaged the film for its apparent SRK histrionics, which seemed to be hyperbolised further by the insufferable Rohit Shetty (a contemporary, but less savy heir to Manmohan Desai). Chennai Express like Dhoom 3 were supported by relentless marketing campaigns with stars like SRK managing to appear on endless Indian TV shows with the singular intent of convincing the public to get behind the film. Nonetheless, Krrish 3, Race 2, Aashiqui 2 and now Dhoom 3, all succeeded at the box office. Was this the year that Indian cinema finally discovered sequels? Dhoom 3 broke box office records and has already been crowned the highest grossing Indian film of all time. The Dhoom and Krrish franchises certainly point to a new future for Indian cinema of transmedia storytelling and branding. Franchises seem especially important for studios in terms of revenue streams including merchandising. This is bad news for lovers of Indian indie cinema since the UK release schedule for Indian films is likely to get even more competitive over the years. That is unless you are in India where multiplexes cater to the ‘politics of difference’. India’s Oscar entry: Realist vs. Middle Cinema? 2013 also witnessed the continuing decline of once innovative genre director Ram Gopal Varma with both The Attacks of 26/11 and more despairingly Satya 2 receiving critical derision. RGV tends to work on low budgets and is able to recoup most of his costs for the films he makes but innovation has given way to a kind of hyper delusion concerning his skills as a filmmaker. One of the biggest disappointments of the year was the much-anticipated Ghanchakkar from director Rajkumar Gupta. Although Vidya Balan and Emraan Hashmi are splendid, the film’s script is insubstantial and fails to deliver in terms of the genre tropes being re-mixed. Nevertheless, Ghanchakkar is a potential cult film. The race for India’s Oscar entry came down to a battle between The Lunchbox (a favourite at many film festivals) and The Good Road. 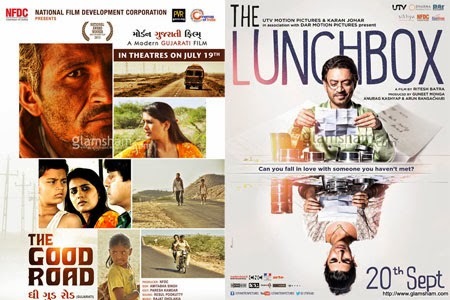 Whereas The Lunchbox is classic example of middle cinema with a charismatic leading role by Irrfan Khan, The Good Road, a Gujarati film, is typical of realist projects financed and supported by the NFDC. The decision to select The Good Road over The Lunchbox raised the ire of producers Karan Johar and Anurag Kashyap who responded by criticising the Film Federation of India as embracing an archaic selection policy that is both inward looking and determined by criteria that reeks of an art vs. commerce snobbery. Having not being able to see either film, from what I have read, The Lunchbox’s exposure at film festivals and its feel good factor may have worked better to convince Academy voters. Tamil Cinema has and continues to be a cinematic blind spot for me. I tend to gravitate to Bengali cinema because of its past associations with auteur cinema and that it continues to produce some of the more ideologically engaged filmmakers. Mainstream Hindi cinema has started to increasingly and reflexively appropriate populist elements from both Tamil and Marathi cinema – this has been evident in the way stars and directors have crossed over in the past but now is even more evident visually especially with the realist action cinema like that of Bala (a Tamil director) appearing transparently in films such as Chennai Express, Rowdy Rathore and R… Rajkumar. Pizza, a Tamil ‘ghost’ film I saw this year on DVD, is a startling directorial debut by Karthik Subbaraj. Pizza is a film as sophisticated, modern and cinematic as anything being made anywhere in the world today. I’m told a sequel to Pizza has already been released. Bollywood’s accelerated interest in regional cinema may come across as somewhat exploitative, but it yet again points to the way mainstream Hindi cinema continually draws on regional films for new ideas. Is it right to say then that innovation resides in regional cinema like the Tamil film industry? If this is true then it not without reason why both Mumbai could be labelled as inferior when put up against the regional power of the Tamil film industry for instance. Regional filmmaking hubs like Chennai are still more advanced than Mumbai when it comes to new film technology and technical accomplishments. In many ways, 2013 appears to have been an inconsequential year for Indian cinema. Perhaps the major development and one that is likely to see a continuing growth is the emergence of a viable, innovative and much needed indie cinema, which seems to have attracted the support of studios, audiences and critics. It will be interesting to see if it can evolve into something ambitious as the parallel cinema movement. 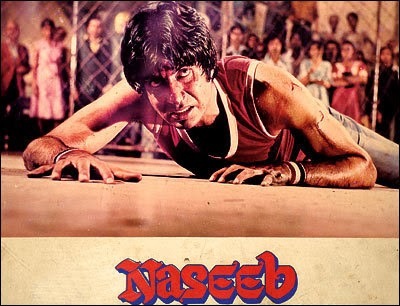 One final point of interest in terms of an emerging cycle of films, if not a new sub-genre, is one I would dub ‘neo-masala’ cinema. Although like Mumbai noir, it is hard to pinpoint an exact point of origin, recent films like Kaminey, Dabaang, Singham have introduced a hard body aesthetic that recalls a stoic, if not misogynist, brand of masculinity which seems like a complete rejection of the metrosexual male embodied by SRK. Concurrent to a reiteration of traditional gender norms is a postmodern reflexivity with films such as Aurangzeb and the forthcoming Gunday paying homage to the 1970s angry young man cinema. 1. AURANGZEB (Atul Sabharwal) – It came; it went and did no business at all, but what a revelation. 2. 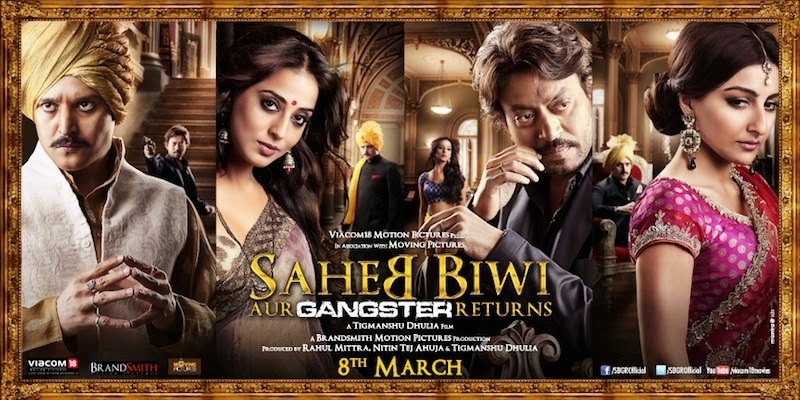 SAHEB, BIWI AUR GANGSTER RETURNS (Tigmanshu Dulia) – a sequel that builds on the first film and marks out Tigmanshu Dulia as one of the finest mainstream filmmakers at work today, and a director who understands ‘genre’. 3. 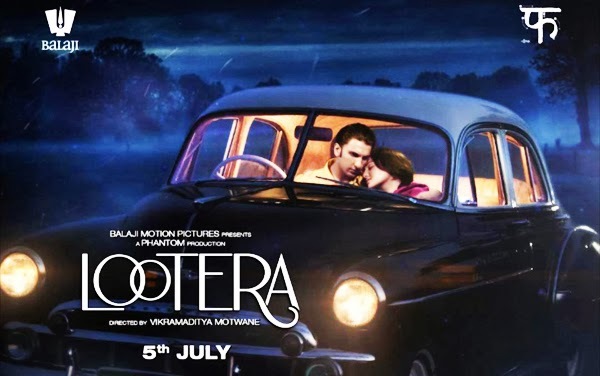 LOOTERA / ROBBER (Vikramaditya Motwane) – a little uneven at times but still terrifically realised in terms of period detail and a love story that works, just about! 4. GOYNAR BASKHO / THE JEWELLERY BOX (Aparna Sen) – a ghost, a housewife (played effortlessly by Konkana) and a gentle love story all make for compelling melodrama in the hands of director Aparna Sen.
5. 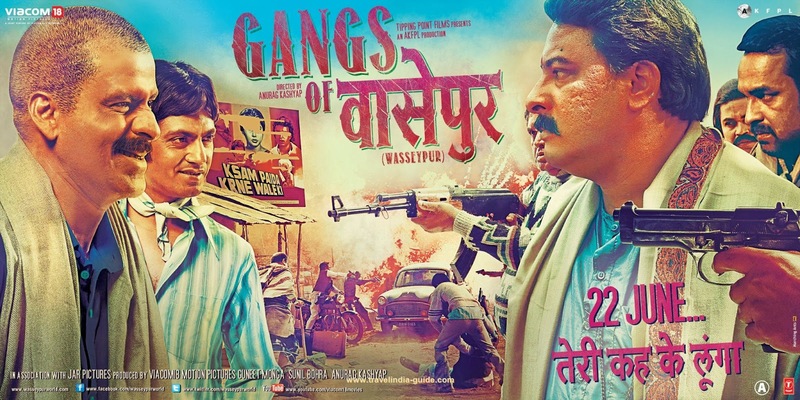 GANGS OF WASSEYPUR 1 & 2 (Anurag Kashyap) – a delayed release for Kashyap’s epic crime saga but surely a most remarkable film (never mind all the detractors!) from one of Indian cinema’s finest filmmakers working at his peak. An instant classic. 6. 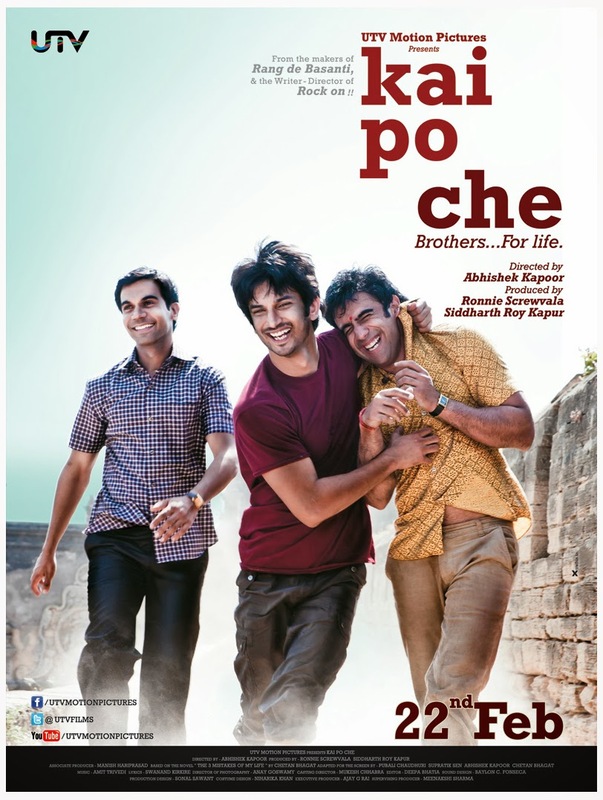 KAI PO CHE (Abhishek Kapoor) – based on Chetan Bhagat’s best selling novel ‘The 3 mistakes of my life’, this film straddles line between mainstream and indie cinema; this is middle cinema with a heartfelt ideological message of the need for co-existence. 7. CELLULOID (Kamal) – a sentimental film but done with such resounding affection for pioneer J. C. Daniel, the father of Malayalam Cinema; the final phase of Daniel’s life as a recluse and pauper resonated with me long after the film had ended. It’s a story that needed telling. 8. 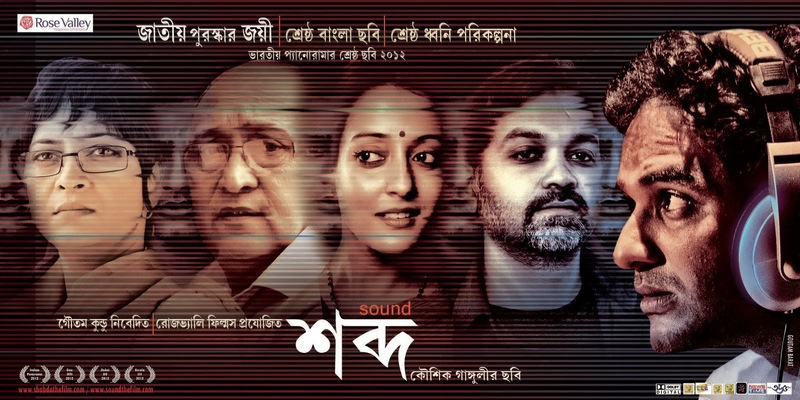 SHABDO / SOUND (Kaushik Ganguly) – Kaushik Ganguly is one of Bengali cinema’s busiest filmmakers and Shabdo is one of his most complex and elemental films that externalises the mental breakdown of a Foley artist. Gorgeous sound design. 9. 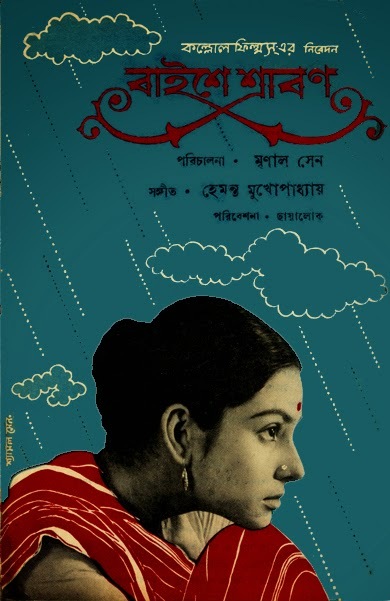 MEGHE DHAKA TARA / CLOUD CAPPED STAR (Kamaleshwar Mukherjee) – a moving biopic on Ritwik Ghatak’s time in a mental asylum. 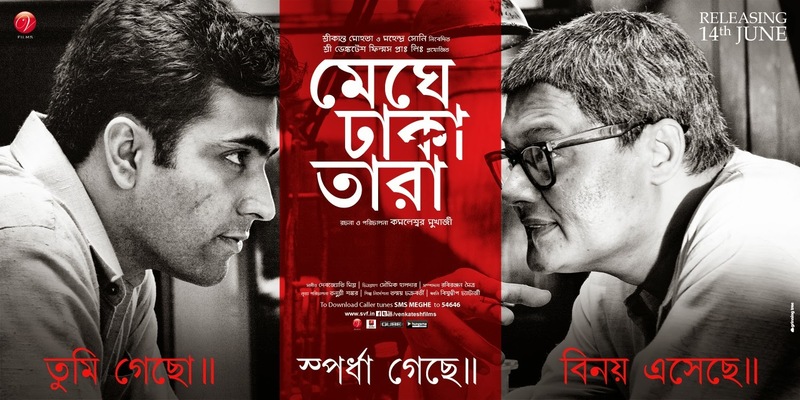 Painfully evocative, expressionistic in tone, and a considerable achievement by Bengali director Kamaleshwar Mukherjee. Incidentally, since we are on the subject of the great Bengali master, one of the discoveries of the year was Ashish Rajadhyaksha’s scholary work on Ritwik Ghatak. ‘Ritwik Ghatak: A Return to the Epic’, published in 1982, and probably out of print, is one of the great works on Ghatak’s films. 10. KADAL / THE SEA (Mani Ratnam) – the return of Mani Ratnam to more authorial traits is something to be welcomed, and although Kadal may not stand up with his best work, it is better than most of what mainstream Hindi cinema has to offer. = SPECIAL CHABBIS / SPECIAL 26 (Neeraj Pandey, 2013) – director Neeraj Pandey, who directed the award winning A Wednesday (2008) builds on such a promise with this brilliantly controlled heist thriller featuring an understated (believe it or not) Akshay Kumar. 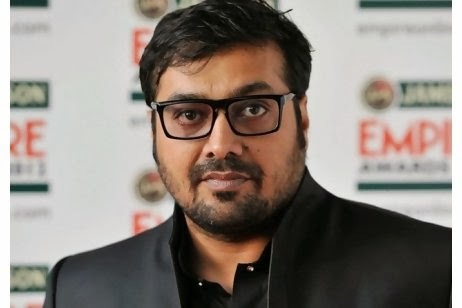 Anurag Kashyap; the most influential director working in the Hindi film industry today? Unfortunately, The Gangs of Wasseypur never really got the UK release it actually deserved. This seems particularly baffling given Kashyap’s prominence as a key player in today’s Indian indie cinema. Had a major star been present in the film then it is more than likely the film would have appeared in more UK cinema screens. Most of Kashyap’s work has been sidelined by UK film distributors for his reluctance to work with major stars and choosing controversial material. Yet 2013 could easily be declared as the year of Anurag Kashyap. He may just be the most important player working in the Hindi film industry today. 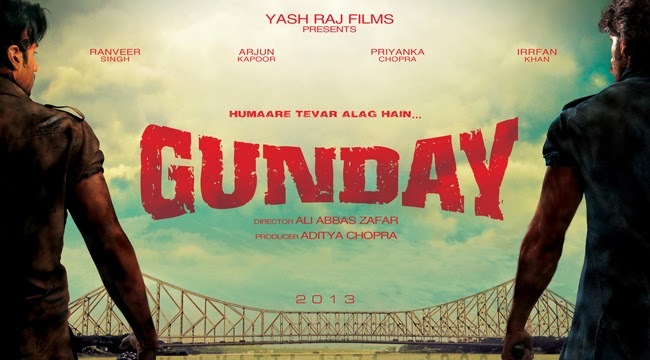 Kashyap not only produced Lootera but also managed to lure director Tigmanshu Dulia out of the director’s chair to act in The Gangs of Wasseypur. At the Cannes Film Festival this year, Kashyap had a hand in all three Indian films that were selected: Monsoon Shootout (producer), Bombay Talkies (one of the directors) and Ugly (director). He also produced a compilation film in 2013 featuring five short films titled Shorts which also got a limited release in India. You can also add The Lunchbox to his achievements for 2013 which he helped to produce. 2014 looks set to be a similarly busy year for Kashyap and remarkably given his exponential work rate, the level of quality has remained pretty consistent across the films he has been involved with. Although I have positioned him as part of a new wave of Indian indie cinema, I would argue the films he is making are more closer to the ‘middle cinema’ often associated with Shyam Benegal. A key film to look forward to in 2014 is Kashyap’s much anticipated Bombay Velvet, a neo noir set in Mumbai starring Ranbir Kapoor, for which he struggled over nine years to get the green light. Pizza is part of a new wave of Tamil cinema. Thankfully the NFDC have now got an online presence and under the DVD label of ‘Cinemas of India’ launched a website which allows you to watch their back catalogue online. Unfortunately, no subtitles at present but I’m guessing the NFDC are heading in the right direction by finally making all of these films, many part of parallel cinema, available for the discerning cinephile. 27 Down, Current, Anhey Ghorey Da Daan and Gaman were released by ‘Cinemas of India’ on DVD in 2013. One of the discoveries of the year was Mehboob Khan’s Roti, a fiercely political and Marxist film, that pleads to reassess the way Mehboob Khan’s status as an auteur has been configured. 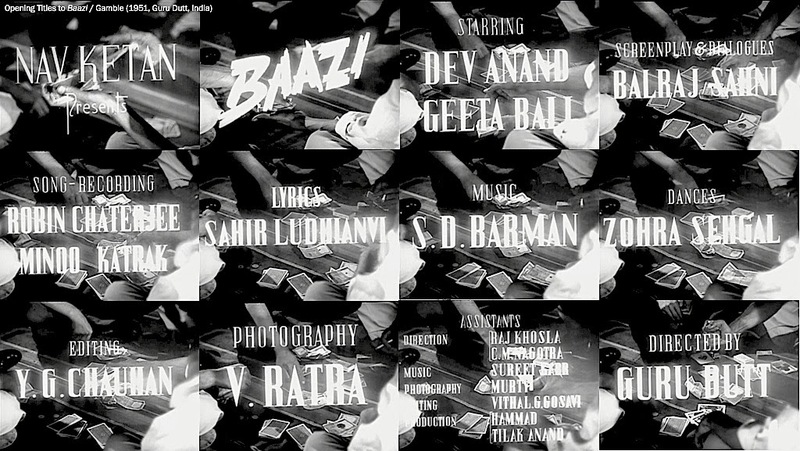 Opening Titles to Baazi – a repertoire of talent. Baishey Shravana / The Wedding Day: one of Sen’s earliest films. This entry was posted on December 26, 2013 by Omar Ahmed in End of year list, film canons, Indian CInema.